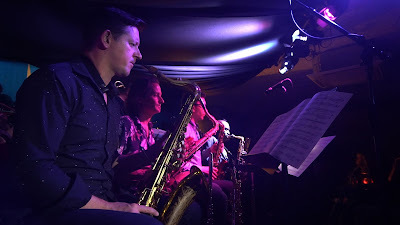 Since its inception as the Big Sky Festival by Vortex founder David Mossman in 2005, the Margate Jazz Festival has been a labour of such love that its ambition eventually outstretched the energies of its organisers. The team nonetheless retain such vital devotion to the music that even during their supposed sabbatical they’ve managed to keep the festival ticking over. In 2017 Binker & Moses put in a memorable appearance (REVIEW), and this year an appealing programme was headlined by UK national treasure Courtney Pine. Olby’s Soul Cafe organised the main evening concerts on Friday, Saturday and Sunday, and the Margate Jazz Festival team put together a supporting ‘fringe’ programme of daytime concerts. The extended Three Plus group at the Lifeboat pub’s two sets included some superior selections: the intensity of Nick Drake’s River Man drove away the noise of the sawdusty craft beer bar, and Keith Jarrett’s 1971 slow burner The Magician In You cast a mysterious spell. The Cinque Ports bistro was energised by the sextet Mampama led by singer and guitarist Kevin Richards, bringing a danceable and emotive blend of influences from West African music and jazz. Such blendings were the hallmark of the weekend as a whole. Friday night festival openers Bansangu are an 18-piece band jazz orchestra playing satisfying original arrangements of bandmembers’ diverse tunes. The compositions and arrangements fuse unlikely influences with confidence, from the “Afro-Peruvian rhythm” of Paul Booth’s Lover’s Thief to the “Celtic Samba” of Pipe Dream. The Thanet-based bandleader makes herding jazz cats look effortless. The band featured inspired soloing from some big talents including saxophonist Jason Yarde and drummer Rod Youngs, and the inventive and dynamic slumpet-playing (slide-trumpet) of Shanti Paul Jayasinha, with trumpeter Ryan Quigley, whose strident tone brought a lift to his cunningly inverted reworking of that famous C-major pentatonic base of Smokey Robinson’s My Girl. 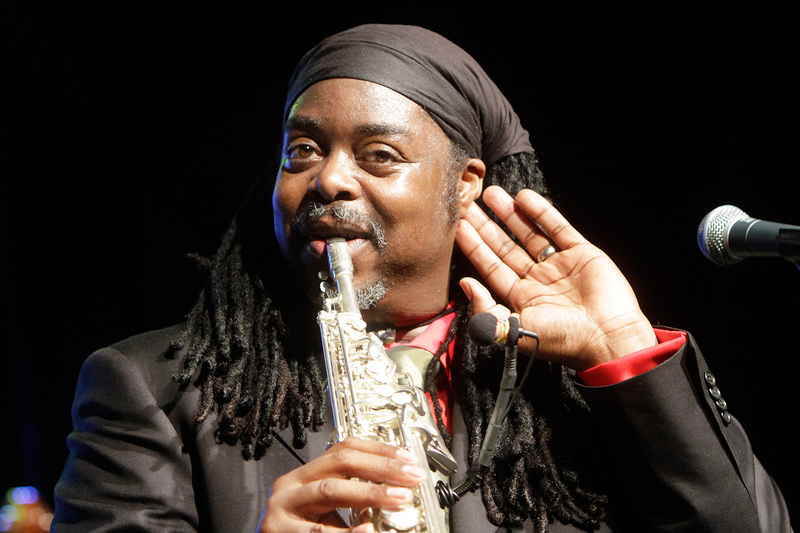 Courtney Pine‘s Saturday night headline slot returned to his 2012 House of Legends songbook devoted to Caribbean influences. “Every note we play tonight is with love and appreciation for the Caribbean,” he said, and you could really feel it. Courtney Pine is a monster improviser with an articulation, clarity and volume that makes his soprano sax playing ring with detail and passion. I’m not such a lover of the EWI (Electronic Wind Instrument) which is like the keytar of the jazz world and similarly liable to both ridicule and defensiveness, but it’s capable of surprising expressiveness in his hands. Without a sweaty bump n’ grind the groove-based nature of the soca-centred music can drag a little; even Courtney stopped his musical tribute to Nelson Mandela twice, though you weren’t sure how much his “I’m not feeling it!” was feeling and how much showmanship—both of which he has in abundance. The blend of London-Caribbean influences puts the 54-year old Officer & Commander of the British Empire in perfect musical synergy with young players who are stirring up the blend at club nights like Steam Down. An extended crowd interaction concluded with a World Record Attempt of 101 jumps in the air, but simply as a player playing disregarding such entertainments he’s a colossus of energy and charisma. 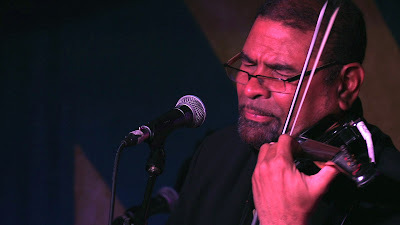 Omar Puente’s electric violin, thick with FX, like the Ewi, can be a weird live sound. His sextet’s 2016 album Best Foot Forward combines a rhythmic base from Cuba and Brazil with an appealing Gallic gypsy melodic lyricism and concisely-formed improvisations. Puente wisely gave the spotlight to Jimmy Martinez’s dextrous improvisations on the bass guitar, with enjoyable solo spots for Jimmy Fernando Depestre on drums, Oscar Martinez on congas, and Flavio Correa on bata drums and percussion. The low ceiling and blocky sound mix made it hard on the ear, but a friendly crowd carried the festival through to a satisfyingly euphoric conclusion. During A Night In Tunisia, played fast in a hard Latin style, the dense chord changes overtook the groovin’ looseness of the group a few times, but Dizzy Gillespie’s immortal classic brought the people out dancing, continuing into a lovely sequence of energetic Cuban classics. All the party people of Margate Jazz Weekend got to their feet and shook it together, bringing the weekend’s enthusiastic party energy from Cuba to the Caribbean into an unlikely but endearing focus in the heart of Margate.